Trent McClenahan and Nicky Riley are both on the lookout for new clubs after being released by SPL club Hamilton Academical. Two players have left Hamilton Academical over the summer, with the SPL club welcoming two out-of-contract players on trial as pre-season training gets into full swing. Australian defender Trent McClenahan and midfielder Nicky Riley have left New Douglas Park, with Darren Young and Eddie Malone both bidding to win contracts. 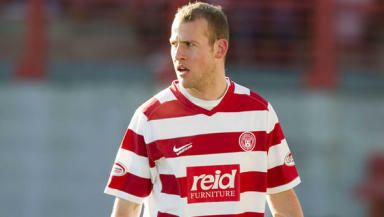 McClenahan, who joined the Accies from Hereford United two years ago, was offered new terms to stay with the SPL club. Former West Ham United player McClenahan, 25, was impressive for Billy Reid's team during his stay in Lanarkshire. A member of Australia's 2008 Olympic side, Hamilton had hoped to keep him for a third season. But that offer was withdrawn by the club after the full-back delayed his decision, with Jack Ross being snapped up instead. “We offered a contract to Trent and he hadn't accepted it so we felt that it was time to move on,” Reid told the Accies' official website. “Trent had done really well for me over the last two seasons but we couldn't give him any longer. Former Celtic midfielder Riley, who only signed for Hamilton in February following his release from the Glasgow side, wasn't kept on and is now training with First Division side Dundee as he looks to earn a contract. The Dundee connection extends to the two trialists hoping to make the step back up to SPL level. Young and Malone were both released by the Dens Park club in the summer as part of a 16-man clearout by Gordon Chisholm. Young, who started his career with Aberdeen before a spell at Dunfermline, managed only six starts from 12 appearances during his two years on Tayside. Sent off on his debut in December 2008 after a long spell out injured, the 31-year-old will no doubt have to prove he has no lingering fitness concerns to convince Reid to snap him up. Malone, a left-sided player who can operate in defence and midfield, is famed for his goal during his spell with Clyde against Celtic, which contributed to knocking the Hoops out of the 2007 Scottish Cup. His form then earned him a move to St Mirren but he was shipped out to Dundee within six months on loan, before earning a permanent deal. Dundee's failure to reach the SPL after spending big last summer led to the cull which Young and Malone were both part of, the out-of-contract pair deemed surplus to requirements as Chisholm attempts to mount a promotion challenge with a slimmed-down squad.